The video below is a short (11-minute) description of IFR Probability. This entry was posted in Uncategorized on April 30, 2015 by Scott Lindstrom. Fog developed along Lake Erie after sunrise on Monday 27 April 2015. 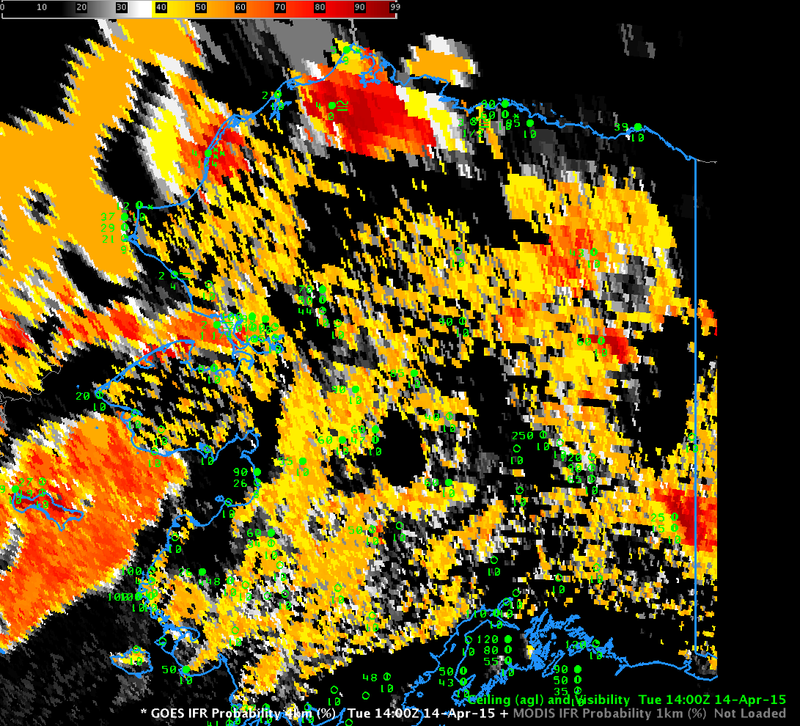 The fog and low ceilings were associated with a line of light showers, so multiple cloud layers were present. 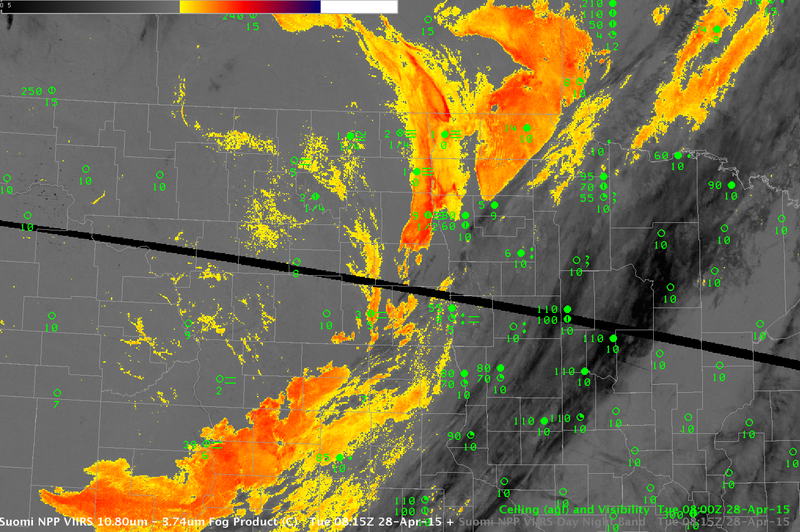 These layers inhibit satellite detection of fog/low stratus. GOES-R IFR Probabilities, above, computed using GOES-13 Satellite data and Rapid Refresh Model Output show very low probabilities at 0800 and 1015 UTC (stratus clouds are observed); at 1215 UTC, IFR Probabilities increase in the counties adjacent to Lake Erie in Pennsylvania and New York; at 1315 and 1400 UTC, IFR Probabilities are high, and IFR conditions are observed in both Erie PA and Dunkirk NY. 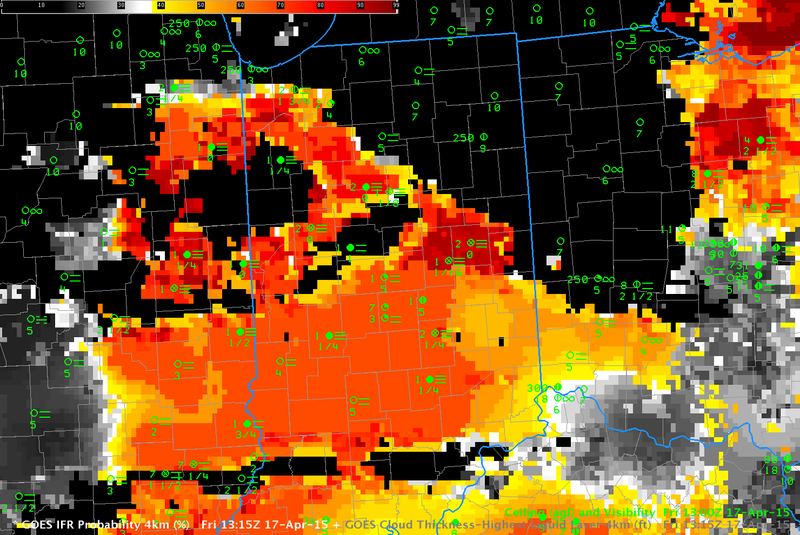 Brightness Temperature Difference fields overnight, above, showed evidence of water-based clouds over much of the area. The fields are moving south, however, leaving the lakeshore behind. The toggle below is of Brightness Temperature Difference and IFR Probability from 1215 UTC. It is far more difficult to relate features in the brightness temperature difference field with reductions in observations at the surface than it is to relate IFR Probability fields with surface observations. Note also that the character of the brightness temperature difference field below has changed because reflected solar radiation at 3.9 µm has become important. This entry was posted in Mid-Atlantic on April 27, 2015 by Scott Lindstrom. For developed over Indiana and surrounding states during the morning of April 17th. An hourly animation of GOES-R IFR Probabilities, from 0200 through 1215 UTC, computed from GOES-East and Rapid Refresh Data is shown above. 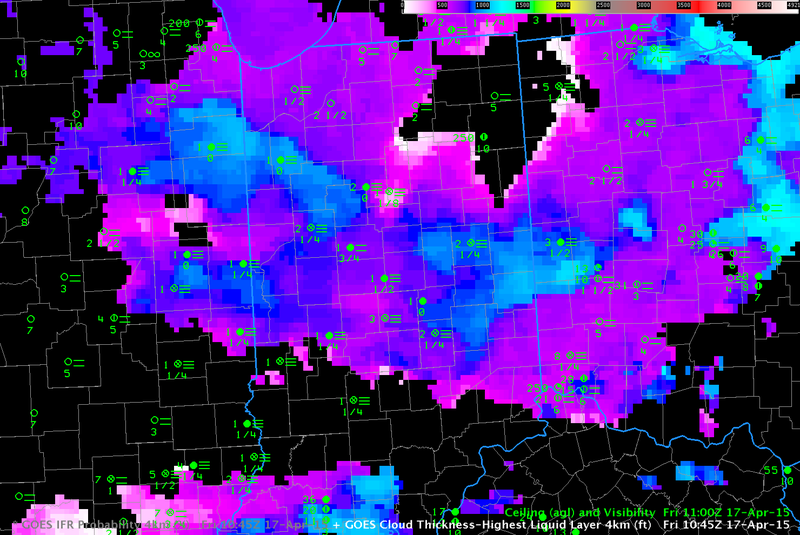 Fog is developing at 0200 UTC, already over portions of western Indiana, and IFR Probabilities increase quickly. By 0700 UTC, large regions show reduced visibilities and IFR Probabilities exceeding 85%. High clouds moving in from the west and southwest starting at about 0800 UTC have an impact on the IFR Probability fields as well. Only Rapid Refresh Data are used to compute IFR Probabilities where mid-level and high clouds prevent satellite detection of low clouds. As a result, the character of the field changes: it becomes flatter (less pixelated) and values decrease (because probability is not so certain when satellite data cannot be used to validate Model predictions). The final image in the animation above, at 1215 UTC, was computed just after sunrise. Note that IFR Probability values generally increase. This is especially notable in regions where mid-level and high-level clouds are present (over southern Illinois and southern Indiana). 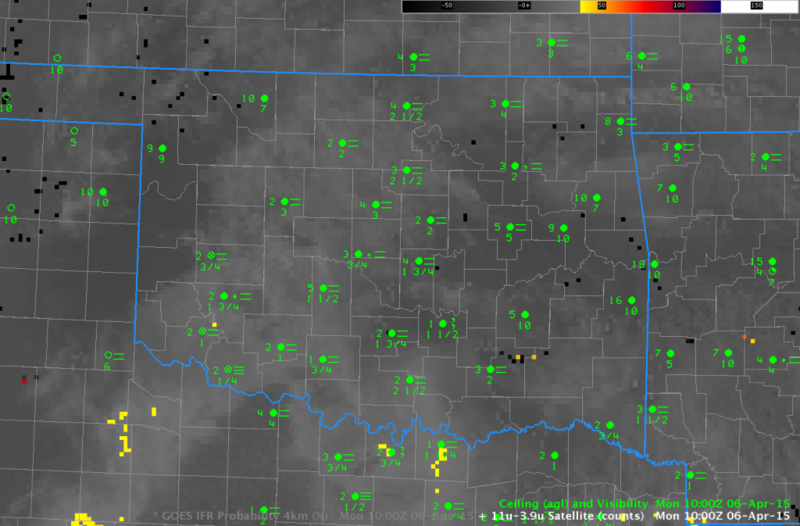 Probabilities are higher because the satellite can detect clouds are present. There are also regions at 1215 UTC where IFR Probabilities rapidly drops to zero. This is likely a difficulty in the Cloud Typing algorithm that occurs with very low sun angle (as discussed here). Holes at 1215 UTC have filled in by 1300 UTC. Cloud thickness can give a first estimate of cloud dissipation time. This link shows a scatterplot with a best-fit line that relates dissipation time to Cloud Thickness from a past study. 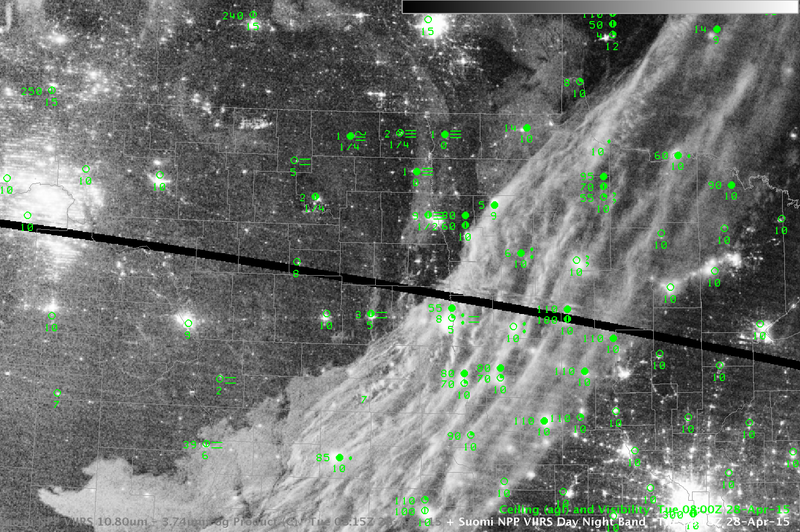 The Cloud Thickness used is the final one computed before twilight conditions, and that is shown below. (Note that cloud thickness is not computed in regions where mid-level and high-level clouds exist) Much of the fog over Indiana is relatively thin — less than 800 feet thick — with a few regions that exceed 1000 feet. Burn-off of this fog should be relatively quick, and most of the Dense Fog Advisories expired at 1400 UTC. * VISIBILITY: A QUARTER MILE OR LESS. This entry was posted in Dissipation Time, Midwest on April 17, 2015 by Scott Lindstrom. Denver International Airport had a period of restricted visibility during the morning of 7 April, starting around 0830 UTC, when northeast winds ushered in low ceilings and reduced visibilities. 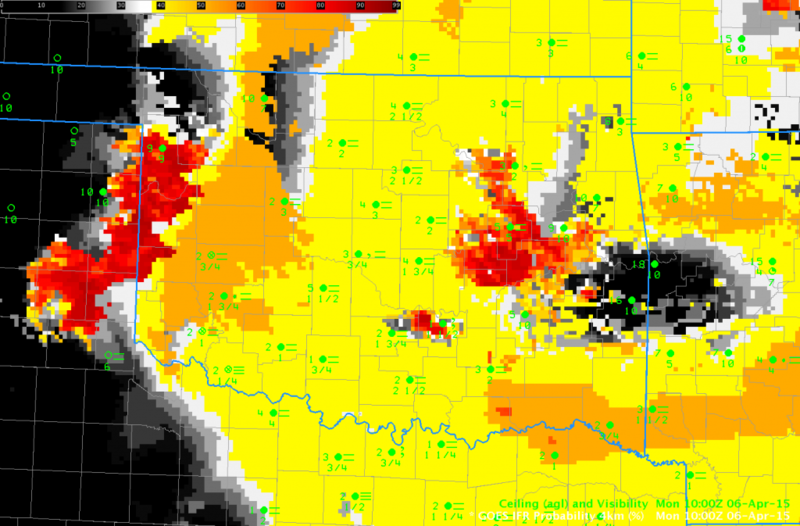 High Probabilities in the IFR Probability fields shift west and south with time, demonstrating how the fields can be used to anticipate the development of IFR conditions. This entry was posted in Forecast, Plains, Rocky Mountains, Uncategorized on April 7, 2015 by Scott Lindstrom. The heritage, traditional method for detecting fog and low stratus is the brightness temperature difference product, seen above (with an enhancement) at 1000 UTC on 6 April. It is difficult to discern a difference in the field over regions where IFR conditions are reported versus regions where IFR conditions are absent. In contrast, the IFR Probability Field from the same time, below, neatly outlines the regions of IFR conditions, and, importantly, does not highlight regions — such as Fort Smith AR and Poteau, OK — where IFR conditions are not present. This entry was posted in Plains on April 6, 2015 by Scott Lindstrom. 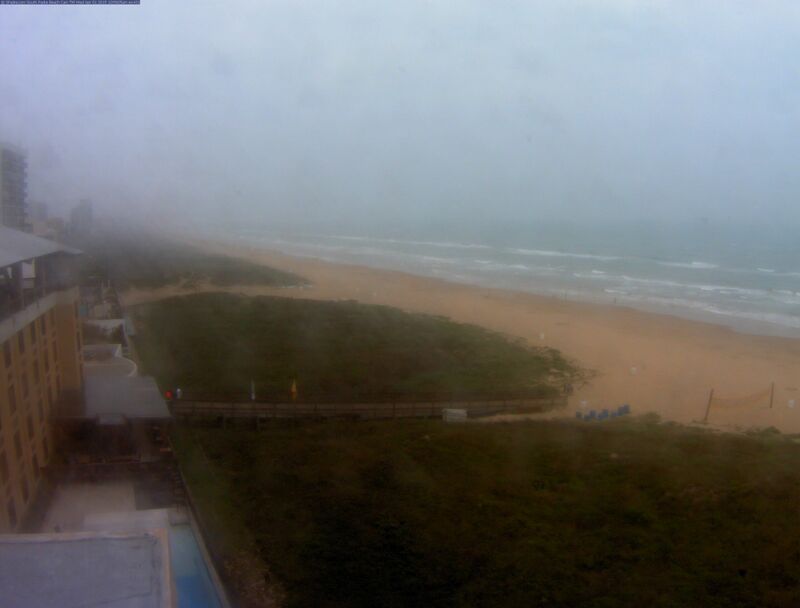 Webcam imagery from South Padre Island between 10 and 11 AM on 1 April (above, from this site) showed dense fog that had rolled in from the sea. 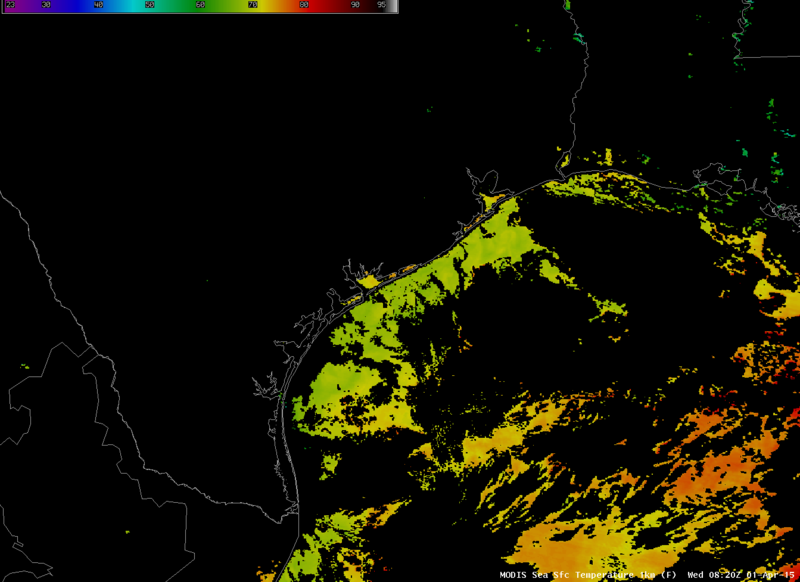 This is likely an advection fog formed as humid air over the Gulf of Mexico moved over relatively cooler shelf water. 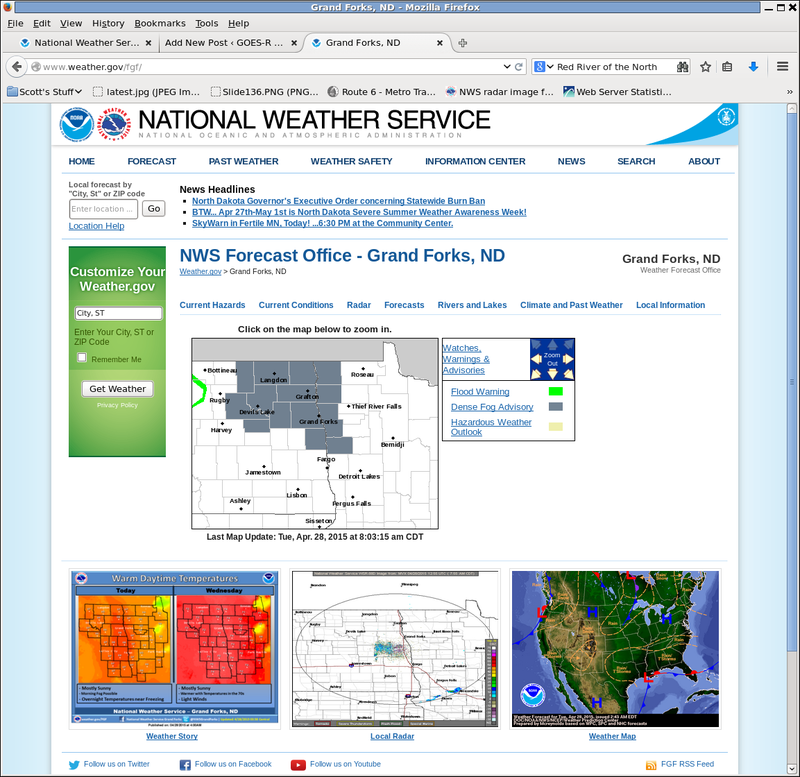 SSTs in the region were in the upper 60s (Fahrenheit) as depicted by the image below. 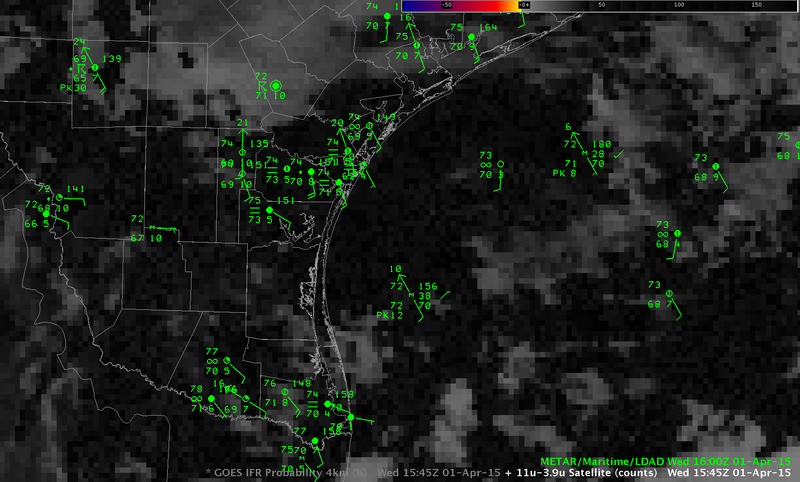 GOES-R IFR Probabilities, below, suggested the presence of the IFR conditions that existed at the coast. 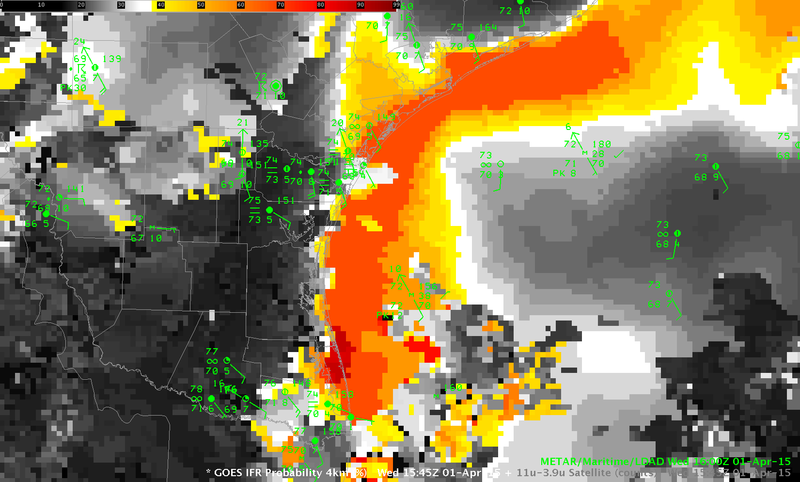 Very high probabilities are concentrated near South Padre Island, and spread north and northeastward, with highest values hugging the shoreline. Brightness Temperature Difference fields at the same time gave little surface information because of the presence of high clouds. A similar event occurred in March 2015 along the Florida Atlantic Coast. (Link). This entry was posted in Uncategorized on April 1, 2015 by Scott Lindstrom.